My name is John, which, as you can guess, is a pretty common name. The benefit of having a common name growing up is that whenever I went into a gift shop that had items with names on them, such as cups, buttons, belts, or what-have-you, I could always find one with my name on it. In sign langage, unlike the items in the gift shop, there is no sign for John. That is, there is no specific sign that can be used for everyone who has the name JOHN (or any other name). Since there is no common sign for a name, when refering to a person by name, you often just fingerspell it. You can learn more about fingerspelling and the signed alphabet in the "Fingerspelling/Alphabet" section of the site. You can also have any name (or anything else) fingerspelled on Signing Savvy. Just type the name to be fingerspelled in the search box and click the "Find Signs" button. Since there is likely not going to be a sign for the name, the site will inform you that it was not able to find a sign, however you can have it fingerspelled. In this case, I clicked the "Have JOHN fingerspelled?" link. The resulting video shows the fingerspelling of my name. If you are searching for a name that has another English meaning, such as "AUTUMN", you will see the sign for the non-name meaning. In this case, you want the fingerspelled version of AUTUMN not the sign for the season of the year. To see the fingerspelled version, just click on the "FS" button to the right of the word to switch to the fingerspelled version. Fingerspelling your name can seem a bit impersonal, especially among friends. So, members of the Deaf community often give each other sign names. Your sign name is often related to something about you (a characteristic). For example, if you have curly hair, your sign name may be a combination of the first letter of your name and the sign for curly hair. Culturally, it is not appropriate to pick your own sign name and only Deaf people assign sign names. When you first use a sign name in a conversation, you would fingerspell the name and then show the sign name. Once the people know who you are talking about, the sign name makes it easier and more personal to refer to the person during the conversation. When you are signing directly to someone, you often just sign YOU (point at him or her) to refer to the person you are talking with and ME (point at yourself) to refer to yourself. When you are talking about someone else who is NOT there, you can use a similar technique, called pointing in space. In this case, you would identify the person by fingerspelling their name (or describing them, such a "my father"), and then pointing at a location in space (usually to the left or right of you.) The first point marks the space that represents the person you named. Afterwhich, when refering to the person in the conversation, you can just point to the location you marked. This is another big time saver when refering to someone many times during a conversation. I liked this facility. It is helpful for English learning. Thank you so much for the site and the help! You guys are wonderful! I second that statement of gratitude. SigningSavvy.com is a FABULOUS web resource and is an incredibly valuable contribution to the global resource of the Internet. Kudos! I also must say that your videos are really great, even at the standard size. It's very easy to see the important subtleties in your videos, particularly because of your choice for a white background and darker clothing (and it goes great with the website design). Also, John is very easy to look at as well, so I always enjoy my visits to this site. Keep up the good work, and many thanks on behalf of hearing persons like myself, particularly for the insights such as this blog posting...I didn't know that you weren't supposed to make your own personal name sign! Thanks for saving me from a potential faux pas. (c: Also, pointing in space makes such obvious sense...sign is so much more logical than proper English. I'm so glad I joined all of our pre schoolers can now sign "jesus loves me"
If I understand the article correctly, name signs are used amongst people who know eachother. If I'm given a name sign by someone within the "deaf community", that really means a small group knows me by that nickname. When I meet new people, I resort to finger-spelling my own name until they get to know me. Is there a generally accepted practice where I can inform a new group of people of a name I've been given elsewhere? When you introduce yourself to new people, you will fingerspelling your name first and then tell them your sign-name. If they understand the culture and process, they will understand that that was a name given to you by someone from the Deaf community. They may ask why a certain characteristic was used or why you you were given that specific sign name but you should be able to explain that to them. First Deaf Contestant on the Amazing Race! A few of us at Signing Savvy are big fans of the Amazing Race. As we watched the first episode two weeks ago, we were excited to see the first-ever deaf contestant to be on the show! As the Amazing Race participants travel the world, they often encounter language barriers. However, Luke, who has been deaf since birth, and his mother, Margie, felt they might have an advantage over other contestants since they have such strong communication skills with each other. They also commented they could strategize in front of the other teams without them understanding what they are talking about. Luke and Margie use ASL and their own short/fast version of sign language to communicate with each other. For those who may be learning ASL, notice when Phil signs, “You are team number one!” that he actually signs the words: YOU TEAM NUMBER ONE. When signing strict ASL, there are often words that are skipped, as is the word “are” in this example. When you use the Savvy Interpreter tool and search for “You are team number one,” the interpreter signs the strict ASL version, without the word “are,” by default. About the Savvy Interpreter: The Savvy Interpreter is a tool available to members of Signing Savvy. The Savvy Interpreter links signs together to give you an idea how to sign phrases and sentences. Note, currently the Savvy Interpreter does not translate from English syntax to ASL syntax. It interprets based on the word order you type. Once the interpretation is made, you have the ability to modify the word order to your liking. The Amazing Race is Sunday nights at 8pm ET on CBS. We look forward to cheering them on! I am rooting for you! You are my favorite team! May the Lord be with your spirit! In 2005 we realized that, while there were a few good sign language resources on the web, there really was no site that provided a comprehensive reference for those learning sign language. The closest sites out there were the ASL Browser developed at Michigan State University and Signing Online. I was actually involved in the development of both these sites. The ASL Browser was developed back in 1996-1997. At the time, the site was quite revolutionary. Digital video on the web was just in its infancy. We took the 2500 digital videos from the Personal Communicator CD-ROM developed by Michigan State University (winner of the Discover Magazine Software Innovation of the Year Award in 1995), organized them into a logical fashion, and placed them on the web. It has been the number one reference for American Sign Language on the web for over 10 years. However, it is now showing its age. The signs on the site are small, postage stamp sized videos (which was all that was possible when the site was created.) Further, the site lacks any search functionality or other interactive features, such as the ability to create word lists and print signs. Signing Online was developed between 2000 and 2003. 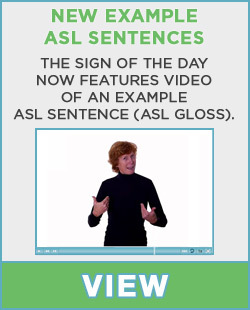 It is a wonderful series of online courses that teach American Sign Language. If you are looking to take a course and like the convenience of online instruction, I highly recommend them. Signing Online is primarily a set of courses, though. If you already are taking a course or if you already know some signing, what you really need is a reference tool. Signing Savvy fills the void! 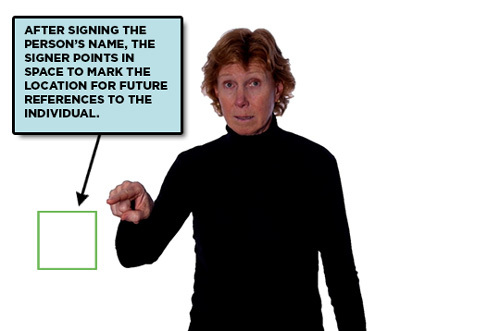 Signing Savvy contains a dictionary of several thousand high-quality video signs complete with sign description and English example sentences. You can find words by searching and by browsing by letter or a number of precompiled semantic word lists. Any word not in the dictionary can be fingerspelled. Best yet, like the ASL Browser, access to the video dictionary is provided free of charge! Our basic service is supported by ad revenue. When working on Signing Savvy we realized that some of you require more tools and features to support your sign language learning. Therefore, we created a subscription-based member service. Membership adds the ability to view even larger, higher quality video, view video full-screen, print signs for reference off-line, build your own word lists, translate English phrases to a sequence of signs (based on the word order you type), view memory aids of signs, and more! You can preview some of these features by clicking on the link below the sign of the day. It took us several years to get the site off the ground, but in January 2009 we launched! What does the future hold for Signing Savvy? While we already have several thousand signs covering over 5000 English words, we will be continually adding new signs each month, as well as new word lists. In addition to this blog, look forward to a discussion forum and other social networking features coming soon. We are also working on several new member services, such as the ability to quiz yourself or your friends. Our goal is to be "Your Sign Language Resource!" Feel free to contact us and let us know your needs. I am currently in ASL II and have had a terrible time keeping pace with my teacher and the other students. I felt like nobody really wanted to help me. When someone from class did help I just felt like I was wasting their time. I came upon this site and I was astounded on how quickly I learned. I became a member in order to access all the features and I must admit it was worth it. Thank you so much for your help. I recommend this site to other students who need that extra help and boost! I am in ASL 201 and I can vouch for how much this website prepares me for my presentations. I look forward to the continued innovations! I've made it a daily ritual to come to Signing Savvy to see the sign of the day. I am currently studying at ASL level I, but look forward to continuing to grown in my knowledge through classes and THIS great site, Thank you. I have found your site to be invaluable in studying sign. It would be nice to have more deaf idioms on the site, but otherwise, perfect! Thanks so much! This site is just exactly what was needed. I find it immensely helpful. Brilliant design, clear navigation, understandable signing. I am just a beginner, teaching myself using books and church music videos on youtube. So this signingsavvy sure does clean up my signs and fill in my gaps. Thank you so very much. I teach English to preschoolers in Shanghai, China, and I've been using ASL to help them learn and remember the vocabulary we're going over at the time. This site helps me (who has never studied sign language before!) learn along with my students and helps keep them actively learning, rather than just passively listening. It helps give them the courage to try speaking unfamiliar sounds and in general makes English more fun. It has improved nearly every aspect of my classes immensely. Thanks for providing such a useful and easy to use resource!